V-Moda's M-100 will appease audiophiles and fashionistas alike - an impressive feat. V-Moda is a relative newcomer to the headphone realm. Founded on a shoestring budget in 2004 (long before the likes of crowd-funded sites like Kickstarter and IndieGoGo), the company sounds more like a telecom outfit than a purveyor of consumer headphones. But V-Moda is one of those rare, quick risers in the audio industry – due in part to the unique design of its headphones – which attracted such big players as Virgin and Apple fairly early in the game. Fashion is a big part of V-Moda’s image. The company boasts, among other things, being the first headphone maker to offer cables in multiple colors. But V-Moda’s flagship headset, the M-100, has been making waves for more than just good looks. Offered at $300, the headset has garnished praise around the industry for its sound as well as its style. And that’s what got us interested. Of course, we’ve heard this story before. And more often than not, we’ve been burned by styled headsets that promise “studio quality” audio, but end up sounding more like a pair of subwoofers strapped to our heads. With its large 50mm drivers, we wondered if the M-100 would be any different. We recently sat down with the headphones for a thorough test to see if they lived up to the hype. Here’s what happened. Unfastening the buttoned straps of the M-100’s colorful cardboard package revealed a pack of instructions atop an impossibly-small black case. As we pulled the rubberized receptacle from the box, the regal ‘V’ molded onto the front and back reminded us of the chest armor belonging to one of Hollywood’s rebooted superheroes. 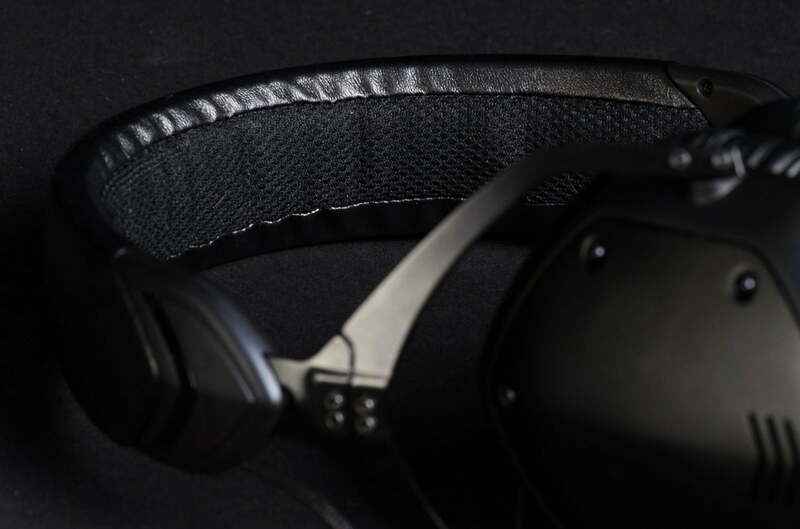 Inside the heroic case was the all-black M-100, its sleek, hard-shell ear cups folded neatly under the headband, accompanied by two braided cables and a gold plated ¼-inch adapter. 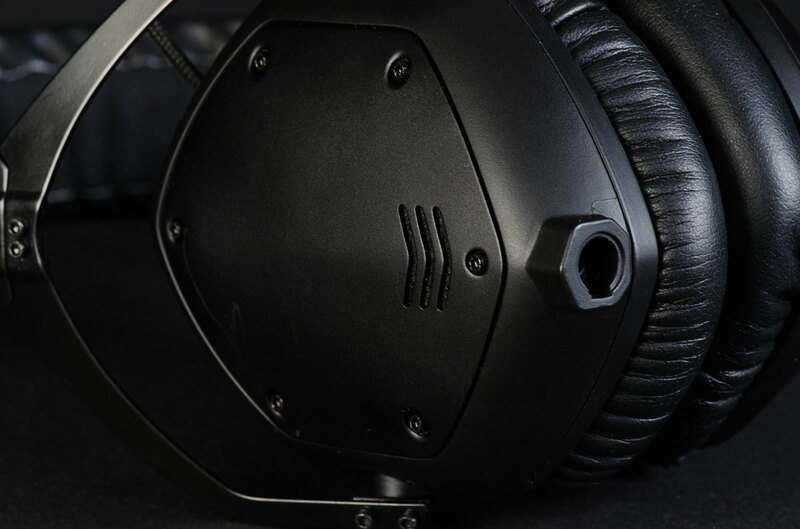 The M-100’s sharp angles and diamond-shaped ear cups give them a dynamic appearance that is at once elegant and rugged (in fact, V-Moda claims the M-100 has been drop-tested over 70 times). The ‘V’ shape, which is boldly outlined on the case, is also applied subtly to the durable steelflex headband, forming sharp diagonal lines at the end points. Extending from each point are metallic arms from which the ear cups swivel on the horizontal access, and also collapse inward on a hinge, allowing the headset to fold into its nimble travel mode. The headband is sheathed in a leather cover, with a mesh pad lining the underbelly. 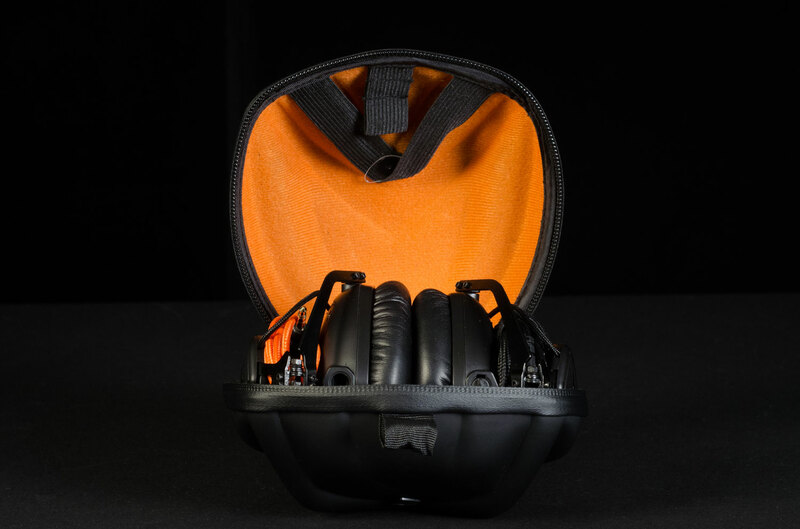 The M-100’s ear cups are constructed of rigid plastic and sport hexagonal metal plates on their exterior which can be swapped out with a variety of replacement designs on V-Moda’s website for around $25. On the interior, the ear cups house plush leather pads which encircle the M-100’s dual-diaphragm 50mm drivers. The memory foam pads press tightly to form a firm seal around the ear, creating a decent amount of noise isolation. The M-100 are armed with an interesting set of connections found on each of the ear cups. Dual inputs allow the listener to either daisy-chain the M-100 to other headsets for shared listening, or to connect two different inputs at once — a nice addition for all those serious multi-taskers out there. To test the feature, we created a pretty interesting mashup of Bowie’s “Life on Mars” with Depeche Mode’s “Blue Dress.” Fun times. 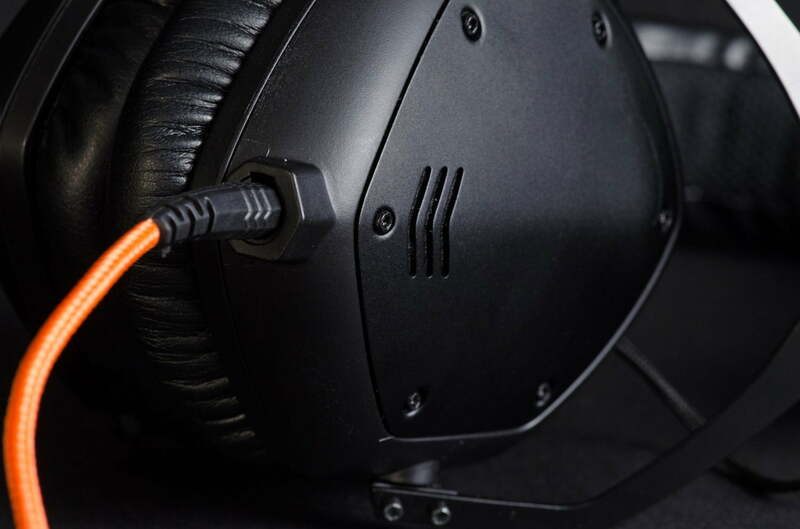 As mentioned earlier, the M-100 ships with two braided cables which are shielded in Kevlar. 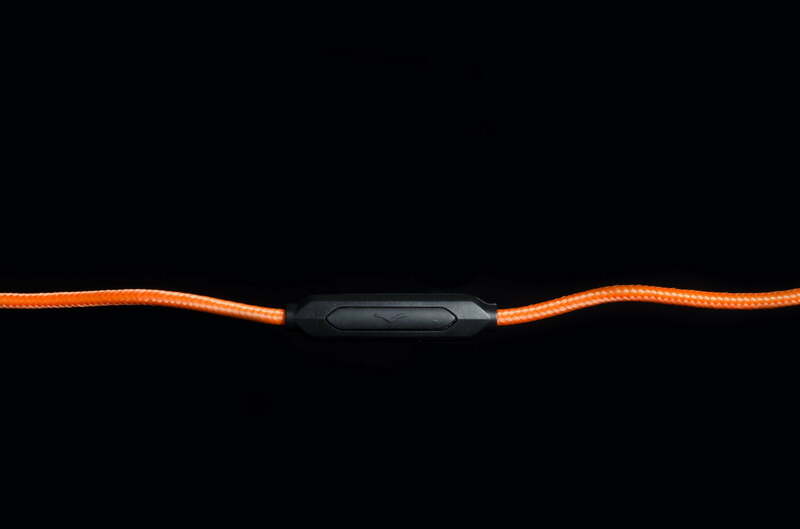 One of the cables is orange and includes an in-line microphone control with a separate, single-button control piece for Android and other smartphones. The other is black and has a splitter attached to the end, adding yet another input to the headset. Both cables are terminated with an angled 3.5mm jack, plated in gold. 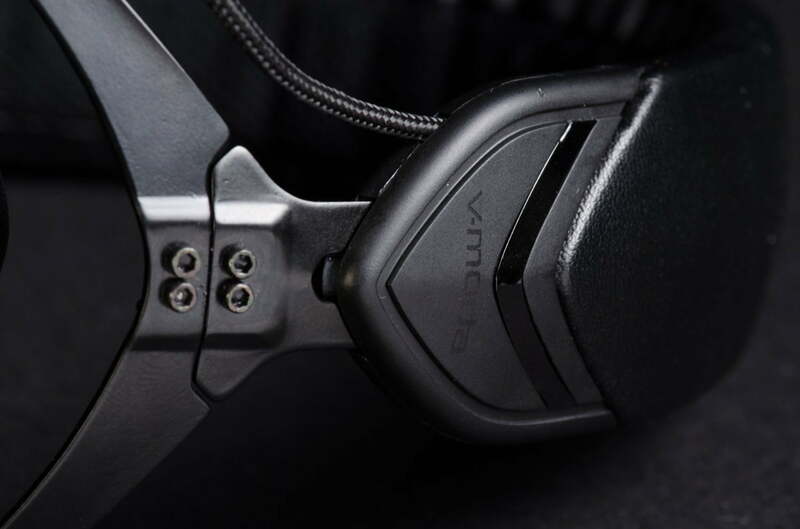 A boom-style mic for gaming, and an iOS-compatible, 3-button cable are also available for purchase at V-Moda’s website. Though the M-100 are solidly constructed, the headphones are relatively light on the head. We found the slim pad on the headband more than ample for extended listening, while the over-ear pads clamp firmly to the head without overbearing pressure, providing a very comfortable fit. We tested the M-100 over a broad selection of titles from our music catalog, both through our iPhone 5, and with our MOTU 896 converter. What we discovered was a brilliantly clear sound signature, accented with a touch of dark amber. The M-100’s powerful drivers provided a vibrant display of tones across the frequency spectrum, displaying a wide stereo image with luscious bass, and a clean upper register. In short, they sound pretty awesome. We began our testing with Radiohead’s King of Limbs, and were immediately struck by the deep dimension in which the myriad synthesizer tones were spread across the M-100’s wide soundstage. Like a great studio mix, the instrumentation was simultaneously extremely well separated, and completely harmonious. What we got was an enthralling listening session which allowed us to either dig deep and investigate each instrument’s well-defined timbre, or simply sit back and allow the beauty to wash over us. Changing over to more acoustic-oriented music, the M-100 revealed an extremely clear upper midrange and treble, rendering acoustic instruments like mandolin and banjo with stark clarity, and vocals with poignant definition. At times, we felt there was just a hint too much bite in the attack on our brightest recordings, but for most of our listening we simply enjoyed the accurate detail the drivers delivered. In contrast, the very upper register had a bit more gloss, due to what we heard as a roll-off in and around the 10-12kHz frequency range. This softer touch reproduced some welcome warmth in the shimmer of big crash cymbals, as well as a creamy texture to high-octave piano and electronic patches. Perusing through other genres, we were treated to rich brass swells, granular electric guitar and Hammond organ, and powerful, full percussion. But perhaps our favorite aspect of the M-100’s sound signature is its handling of bass. Though we found the low end to be just slightly heavy-handed on occasion, it never overpowered the upper register, even while rendering thunderous hip-hop grooves. And the tone was so buoyant and velvety — especially in older 60’s and 70’s recordings — we hardly had reason to complain. Our most memorable bass moment came in the Beatles’ track “Maxwell’s Silver Hammer,” where we were tricked into hearing a tuba in the bass line. We did some investigating, and found that McCartney purposely tried to create the effect with his bass, but we’d never noticed the tone quality until it was reproduced by the M-100. How’s that for an endorsement? 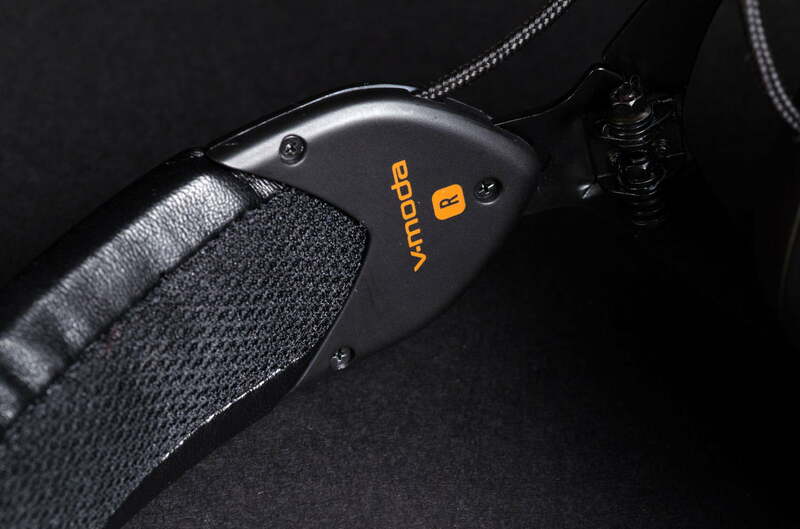 V-Moda’s M-100 will appease audiophiles and fashionistas alike – an impressive feat. 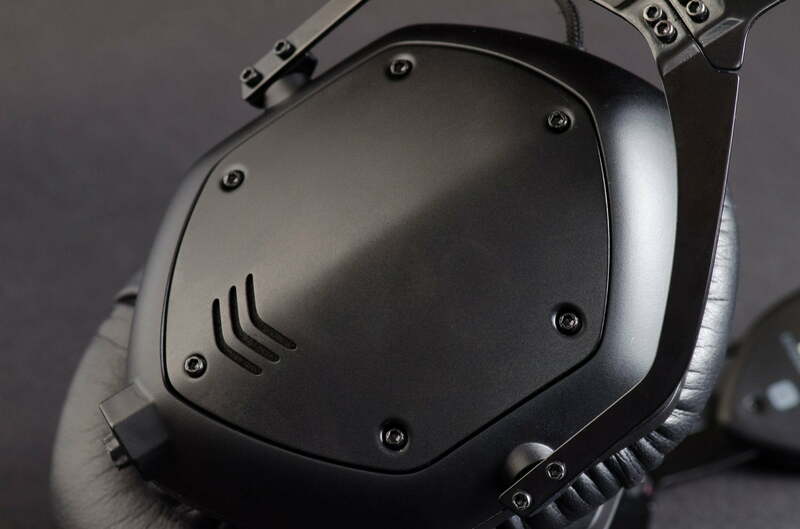 Though $300 is on the high side for a consumer headset, the V-Moda M-100 deliver the rich blend of power, detail, and dimension that we have come to expect from a headphone in its price range. What’s more, the M-100’s handsome, portable design make them not only convenient, but a real joy to take along for the ride. If you’re the kind of person who likes to keep elite sound in tow wherever you go, the M-100 are an outstanding choice; and if you aren’t, a little time spent with the M-100 might just change your mind.